Opinions, reviews and general life evaluations through the lens of real people and the open-source community. My preferred distro is Ubuntu for any new user to Linux. Yes, yes, I’m sure your favorite <insert distro here> is good for new users and you personally think new users want <insert personal agenda>. The only reason I choose Ubuntu is because its where I’m most comfortable and since I’m setting it up and probably performing support, I’m sticking with it. 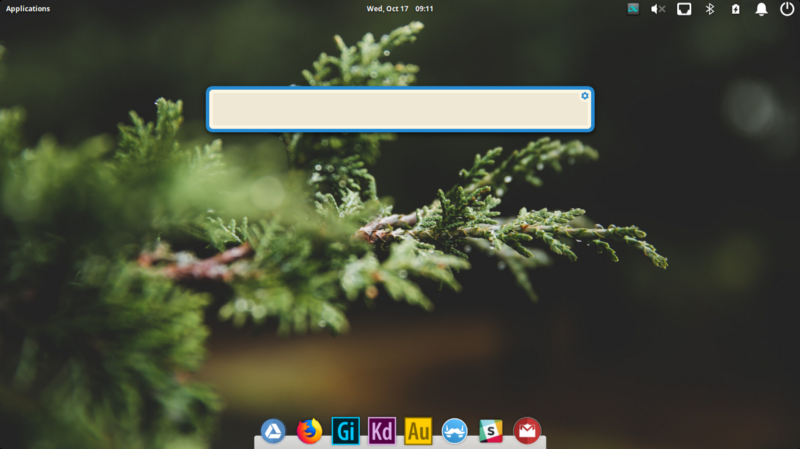 The natural fit for this user who will be using the laptop on a regular basis is Elementary OS. For this install I downloaded Elementary OS 4 Loki. Based on Ubuntu, I’ve heard a lot about it but never actually used it before. In the beginning I was very skeptical, mostly because the current version of Elementary is based on 16.04. Elementary is close to a new release that will be based on 18.04 so I was on the fence going with something I’ve never used before on the verge of a major update. *Since writing this blog, Elementary OS released version 5 Juno which is updated to Ubuntu 18.04. There are also several other updates to the OS. Read the full release blog post here. Running it via Live USB felt good though. Looked nice on the screen, all the hardware worked and even came out of sleep-mode which can be challenging for Linux on certain hardware. I’m in no rush to deliver the laptop so I figured I’d give it a go. 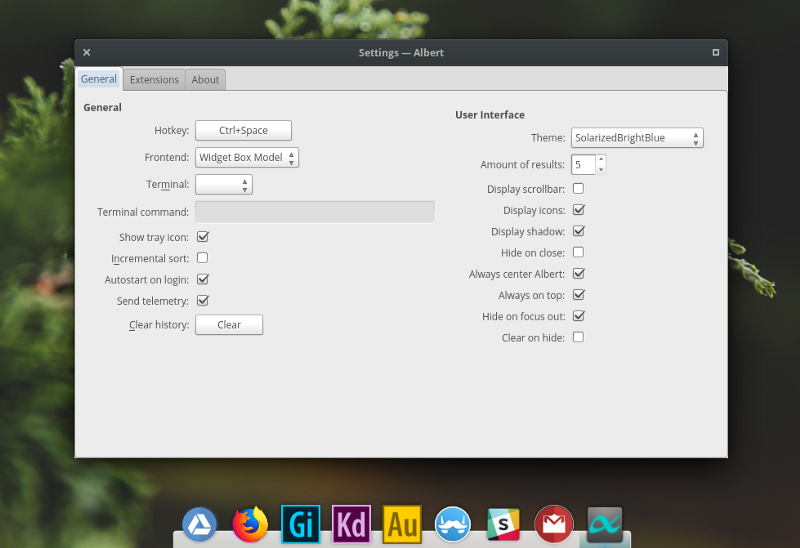 Installed Gnome Tweak tool to make some subtle changes to icons, themes, modes, etc. on a GTK desktop. Set Numix icon pack to the default. Just my preferred icons. After a quick update and some personal settings updates to the touchpad I was ready to go installing the software for the user. For this configuration I created two keyboard shortcuts that are very similar to OSX to take a selection and a full-screen screenshot. Easy enough to create, just go into keyboard settings and make a custom shortcut. For this I made alt+4 for full-screen and alt+5 for selection. By pressing these shortcuts it runs the command shutter -f for full and shutter -s for selection. There’s really only two features I’d like to bring from OSX to this new desktop and both are easy to set up. First things first I installed the screenshot tool Shutter, which if OSX does anything right its screenshots. Shutter is under slow development and has been waning in popularity with Linux users. Its still my preferred app and this time I made it much more useful. I can’t explain why it never occurred to me to create custom keyboard shortcuts for screenshots, but here we are in 2018 and I’m still clicking on the menu bar like an animal. Another addition is the Albert launcher. Searching files and the web from the desktop with just a keyboard command is mandatory. Similar to Spotlight on OSX, Albert allows you to search your computer, the web and specific sites straight from the desktop. I love, love, love this application. I only made a few small tweaks. One, changed the keyboard shortcut to ctrl+space, checked a bunch of extensions and have it launch on startup. Desktop with Albert waiting for a command. Of course right out of the gate I installed Gimp, Kdenlive and Audacity. These were on my list for part-time vlogger and podcaster. 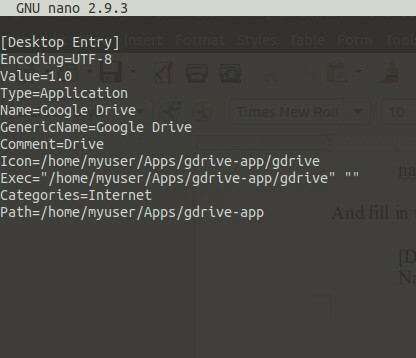 Kdenlive recommends to run the appimage, so I quickly setup a .desktop file (see below how to this). This application doesn’t need any additional configuration, Kdenlive is just fantastic. Same goes for Audacity, which is more than enough for editing their podcast. Gimp however, needs some tweaking. I’m sure many people like the Gimp interface and it works just fine for them. But since I learned how to edit photos in Photoshop, I always try to get as close to that UI as possible. Its not about trying to mimic the workflow of Photoshop, instead being able to quickly recognize the right tools in the menu and them placed in the right spot. Gimp’s standard interface just doesn’t cut it. Gimp themed properly, at least for me. Luckily, someone has already created a Photoshop theme for Gimp. Its easy enough to set up. Just download, delete your old .gimp file in your home directory and replace with the new one you just downloaded. A while back I also found some Adobe-style icons for open-source creator applications that look amazing. You can download the icons on The Adobe Icons Project by DeviantArt user RohitAwate. The project has icons for each Audactiy, Kdenline and Gimp plus 7 other apps. To change the icon all I did was drop them into a folder in my “Apps” folder in my user directory and updated the .desktop file to the location of each icon. You can also follow this guide to update icons on your desktop. Those Adobe icons do look great. This user is heavy into Google Drive and Gmail being part of their workflow. Instead of using Thunderbird for Gmail and InSync for Google Drive desktop syncing they would rather just do it in the browser. They’re not concerned about having the actual files on their laptop. Opening a tab in the browser is easy enough but I wanted to give them a dedicated app feel for Google Docs and Sheets. I’m well aware of the divisiveness around Electron apps on the Linux desktop. Personally, I don’t really care if an app is native or not. My primary objective for any application is that it works. Anything else is secondary. If an Electron app works better than a native app I’ll use it. If a native app is better, fantastic. Using NativeFier I quickly created a few Electron apps for Drive and Gmail then created a desktop file with a nice looking icon. For the uninitiated, NativeFier allows you to quickly create an Electron wrapper for any URL. I tried using the standard Google Drive URL drive.google.com but I ran into login issues. It would load the Drive homepage but when clicking “login” it would open the link in my default browser, not the Electron browser. When changing the link to the above it functioned properly. I went through the same process for Gmail. Then, I created .desktop files for both so I can pin them to the dock. There are many different ways this could be done, but this is what was best for me. Ctrl+O and Crtl+X and now there is a dedicated desktop file for our new Electron apps. Personally, I like this method for a few other web apps I use all the time on my machine. Using NativeFier I also run Todoist and Google Keep in electron wrappers. For some apps its nice to have it in its own window instead of a browser tab. Speaking of electron, I installed two other web apps. First via snap I installed Slack (in these times, work just doesn’t get done without Slack). Next is Franz. This was a new one for me as well and an app I accidentally ran across recently. A couple months ago I was testing WaveBox, which is essentially a chromium-based browser that lets you put various web apps into tabs. Its themed nicely to make it easy to switch between various accounts. After using it for the 14-day free trial I wasn’t convinced enough to start paying for it so I deleted my account and uninstalled. Reflecting back, having the multiple tabs for all the web services I use wasn’t helpful, it was too many. But, if I narrowed it down to just my social media accounts, that would be useful. Having a Facebook, multiple Twitter’s, LinkedIn plus various chat applications having a dedicated browser properly themed and sand-boxed is nice. I could easily pin a bunch of tabs to my browser and set them to automatically open each time the browser launches. Using Franz or WaveBox or Rambox is simpler and allows me to setup all the apps needed for work into a single application. Then once I close it, work is done. 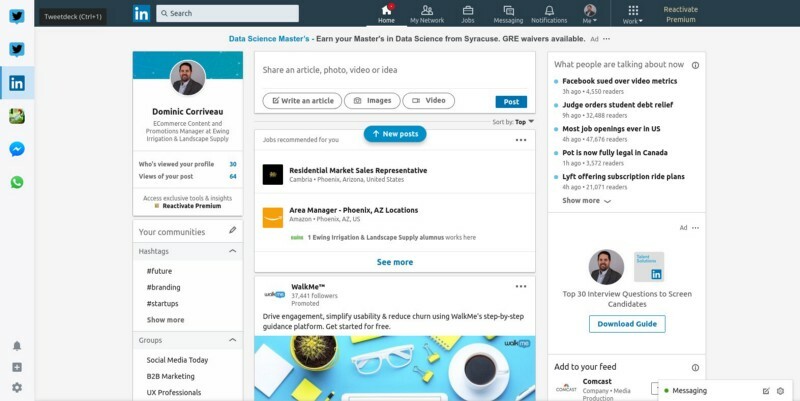 These types of apps are growing and searching for links lead me to Rambox, one I hadn’t heard of before. All of them are cross-platform, have free community editions and a paid pro version. Using one of these aggregators could eliminate setting up the NativeFier apps or installing the Slack snap. For this user its hyper-focused on being strictly social apps, mainly Twitter, but they could set it up however they like at any time. 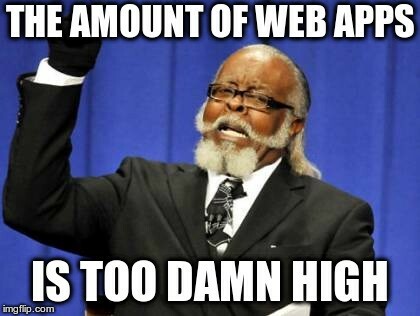 Yes, the amount of web apps is too damn high. As I mention, Electron is a polarizing topic in the desktop Linux community and can be a resource hog. Since I run so many old hardware configurations Electron apps can be an issue. Running Franz, Slack and a few custom web apps I haven’t run into any issues. Going through this customization process has caused me to take a longer look at my personal setup. Custom icons, proper screenshot shortcuts, web apps and a search tool have all made the desktop usage much more enjoyable. Its something I never took the time to create on my primary workstation. Now, my mind is going a mile-a-minute thinking of additional configuration I could be using and the hoops I’ve been jumping through out of laziness. This is also the longest time I’ve spent to setup a new machine for a friend. Normally I throw stock Ubuntu with Chrome installed and tell them to have fun. Thinking more about the users primary workflow, investing more time into configuration and actually creating a plan has solidified why I love the Linux desktop. Up next, the one month review.